Each Brain Candy Ink piece is individually crafted, ensuring that no two pieces are identical. 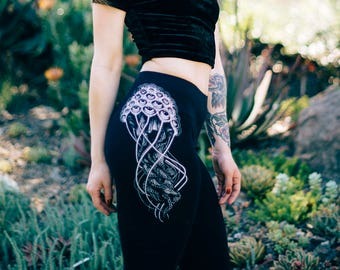 We hope that you can feel the energy and love that goes into your one-of-a-kind piece of artwear. We select styles based on the softness and fit of the fabric – We carry comfortable and flattering styles that are easily dressed up or down and perfect for your active lifestyle. We are constantly evolving, expanding and introducing new styles, designs, and colors. Each step of the design process – from the artwork, screen preparation, and printing, to the tagging and packaging – is carefully executed in the cozy Brain Candy Ink studio loft space to ensure your piece is just right. Our recycled packaging is simple and sleek and can be personalized for special occasions. We strive to create the highest quality product that we can and hope that your online shopping experience is easy and seamless. Please message us with any special requests or suggestions – we would love to make your ideas come to life. Please contact me with any inquiries about my line or your purchases via Etsy Conversations.